You might think that I’m a closet Lara Croft worshiper given how many Tomb Raider thingies I’ve reviewed on this site. Or maybe it just seems that way to me, since I always seem to use this post as my demo model whenever I work on a redesign of Oddball Update; it’s become an odd sort of tradition. Despite that, I’m little more than a common fan — in fact there are several games in the franchise that I’ve never even played, and far more that I never finished. So I didn’t rush out and buy this year’s new Tomb Raider game on release day. In fact, I only just picked it up last week after a recommendation from a friend. For anyone who has been with the series for some time, the 2013 installment of Tomb Raider may feel like quite a departure. It’s a reboot, which has become a popular genre in the film and gaming industry today — meaning that it effectively restarts the long-running series from the beginning, or in this case, a point earlier than the beginning. Specifically, it takes us back to a time when titular tomb raiding heroine Lara Croft was a young budding archaeologist with a decidedly bookish personality, more “Professor Henry Walton” than “Indiana” Jones. 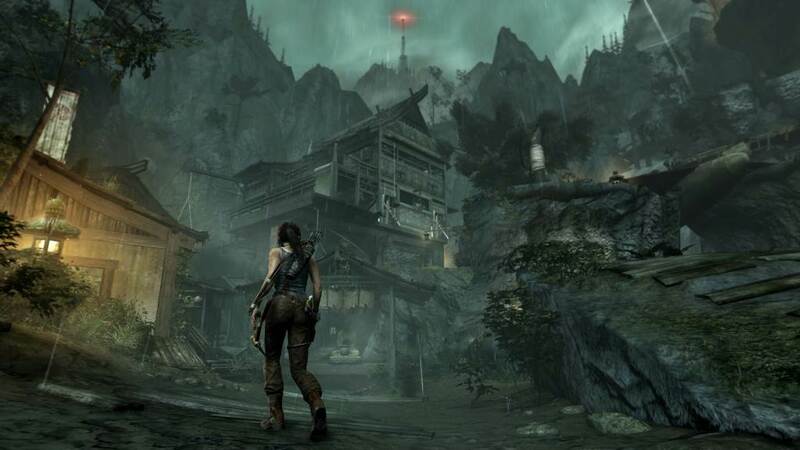 The game appears to show us how Lara was thrust into a survival situation in a perilous and mysterious place in one of the world’s darkest corners, and we are to assume that it is here where she cut her proverbial teeth in the realm of cave-diving, rock-climbing, pistol-shooting and so on. While this sounds like it would lend itself well to a familiar, faithfully-recreated installment of standard Tomb Raider fare, there are significant differences — and not just in Lara’s age and experience. For the first time, 2013’s Tomb Raider paints Lara as more of an “everywoman”, a vulnerable twenty-something thrown head-first into a situation far outside of her comfort zone and then asked to do unspeakable things in the name of mere survival. This Lara is different than the walking-tall, nigh-indestructible badass personified by Angelina Jolie in her film portrayals of the character. The new (old?) Lara Croft bleeds. She screams. She cries. She shakes and shivers. She limps about, clutching her wounds and recoils from physical efforts too taxing for her damaged frame to tolerate. She is far more real. And yet, she is never petulant or pathetic. She’s still a badass, but in a whole new way: rather than gleefully prancing about tapping foes’ skulls with precision-aimed bullets, the new Lara Croft shoots arrows, unloads shotguns and hurls flaming lanterns with the empty gaze of someone forced into terrible acts in the name of self-preservation. She kills her first enemy only as a result of wrestling with him, trying desperately to keep the muzzle of his loaded handgun out of her face, only to accidentally discharge it into his head, after which she tremblingly watches him slowly expire in a gargling mess of exsanguination, barely able to believe what she has done. You can’t help but empathize with her throughout her misadventures, as one barely-believable trauma after another befalls her. When the bad guys come, you’ll blast away at them not with bored detachment or glib enjoyment, but with vengeance-fueled anger for what they’ve done to Lara and her friends. 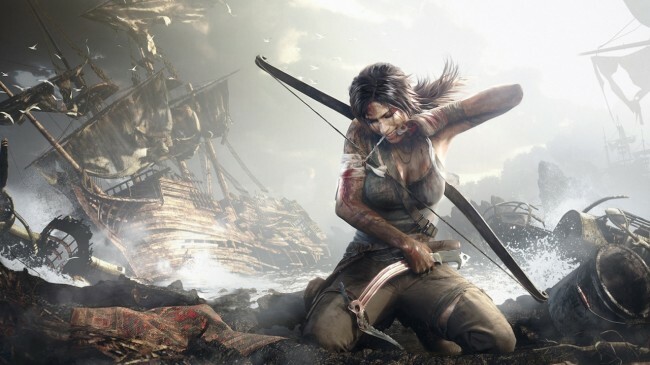 Perhaps the most interesting question to ask in light of this: how different is Lara Croft from the butchering murderers who inhabit the island she finds herself marooned on? Is wanton and gratuitous killing in the name of survival that far removed from wanton and gratuitous killing in the name of some fundamentalist ideals? Or is it a totally different thing altogether? The fact that a Tomb Raider game entices you think like this at all is a sign that the franchise has evolved far beyond the comparatively simplistic “2D platformer in a 3D package” roots of its 1996 debut. 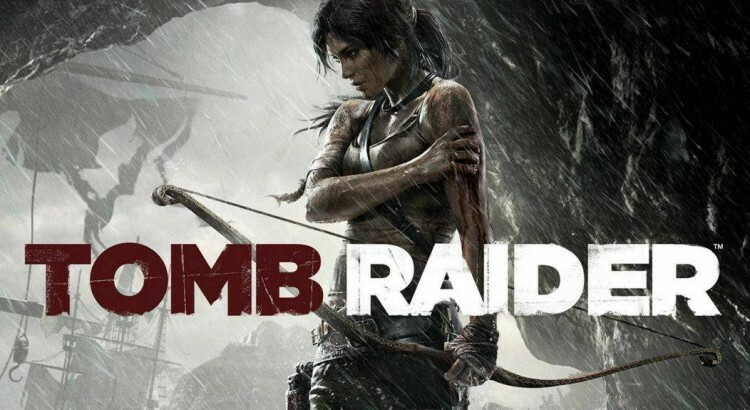 What makes this accomplishment even more impressive is the fact that this is the ninth game in the series, developed by the same Crystal Dynamics that produced Legend, Anniversary and Underworld (not to mention the excellent spin-off game Lara Croft and the Guardian of Light which I also reviewed). Tomb Raider 2013 is not only the fourth game in the series proper to be developed by Crystal Dynamics, it’s also the fourth Tomb Raider game in a row to be better than the one that preceded it. In my view, Crystal Dynamics has accomplished something increasingly rare in the video game industry: they’ve one-upped themselves four times straight. Perhaps even more impressive is the fact that this most recent title offers the most significant improvement of all. In addition to the vastly different (and very impressive) new take on Lara Croft’s character, there are other enhancements across the board in all the usual categories. The new Tomb Raider features absolutely stunning visuals, and this is coming from the Xbox 360 version — which I hear pales in comparison to the PC version when equipped with hardware capable of pushing the full slate of graphical goodies like AMD’s TressFX. The environment of the hostile island locale is particularly well-rendered, managing to convey a real sense of scale and expanse coupled with realistic (and very harsh) weather effects. In a word, it’s gorgeous. Beyond the environment, character models also deserve a special mention. They’re very convincing, excellently rendered and appear to be professionally motion-captured. For the most part, Lara herself moves through and interacts with her environment in such a realistic fashion as to be nearly indistinguishable from filmed footage. 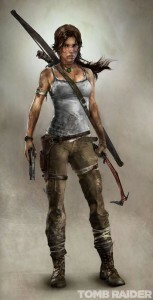 In a further nod to the realism theme that the game is steeped in, you won’t be dressing Lara up in skimpy bikinis or cleavage-accentuating tops — she wears the same torn, bloodied, increasingly dirty and decidedly pedestrian clothes throughout the entire game, just like anybody else who had been shipwrecked on an island without a suitcase. I’m a big sound effects buff, and I’m happy to report that Tomb Raider’s sound design is also above top-notch. Voice work is excellent, accents sound true and age-appropriate for the characters they belong to. Environment sounds do have some audible loop seams but are all of high quality, and I wasn’t able to recognize any “canned effects” from the many professional libraries I’ve worked with. The distant, ominous sounds of thunder in the early levels is among the most chilling I’ve ever heard. Weapon sounds are also fantastic, with the standout being a joyously explosive pump shotgun report that will have you jonesing for any available excuse to fire the thing. Enemy AI seems fairly standard at its core, but adds some unexpected moves like foes who will charge you and flank you, ensuring that you can’t always just camp behind a box and stop-and-pop your way to freedom. Some enemies are armored and carry shields, forcing you to dodge their attacks before countering with one of your own when their vulnerable side is exposed. Throughout, the enemy voice work adds both a measure of realism and a hearty dose of entertainment as your foes react to your combat strategies. “Hey woman!” shouted an entrenched baddie at one point. “Don’t shoot; the Guardians will kill us all!” In response I rose up from behind cover and drew back the string of my longbow, to which his compatriot responded frantically, “It’s no good! Just go after her!” Another time, after putting the smack down on five guys in a row with a myriad of weapons, one of the few surviving foes shrieked in astonishment, “She’s killing us all!” Enemies will also react when you stop to change magazines (“She’s reloading! Now’s our chance!”) or when you get hit by a stray round (“She’s wounded!”), not just in words but in tactics as well. Gameplay is equal parts familiar and entirely new, and both in a good way. There are platforms to jump onto, over and across, ziplines to slide down, rock faces to scale, and mysterious ruins to explore. There are relics and documents to be found which help piece together the backstory (or what we’d call “flavor text” in the tabletop world) of the game environment. There are also, for the first time I can remember in a Tomb Raider game, tons of incredibly fun combat encounters. As I’ve often lamented in my previous dealings with this franchise, combat is usually where Tomb Raider games fall flat. No longer: combat feels every bit as action-packed, frenetic and fun-to-control as it does in Uncharted, the PlayStation-exclusive series which famously out-Tomb Raidered Tomb Raider. In fact, where Uncharted stole Lara Croft’s shooting-and-spelunking crown, 2013’s Tomb Raider steals it right back and then adds several new jewels for good measure. Eat it, Nathan Drake. In addition to fantastic gameplay, an engaging story, impressive sound and graphics and a bold new take on the franchise’s title character, there’s also a satisfying array of collectible-hunting and equipment upgrading to be done. Lara has access to a right-sized assortment of weapons, including her new token weapon of choice, the longbow. Each of these can be upgraded by using “salvage parts” acquired throughout the environment, and new components can even be found to transform middling peashooters into much more deadly tools of destruction. 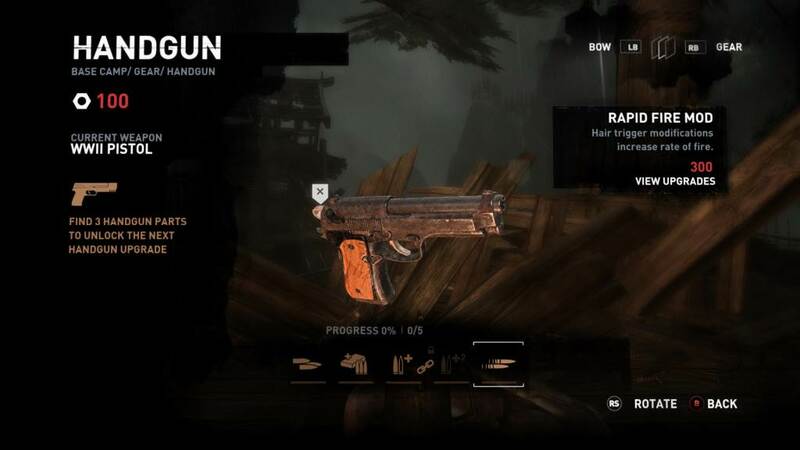 Lara herself can also be upgraded through the skill point system, allowing you to unlock new abilities, gain extra salvage or XP, and much more. If you’ve ever even thought about playing a Tomb Raider game, or if you’ve enjoyed the Uncharted series, definitely give the new Tomb Raider a look. I’ve only just scratched the surface of it in this review, but I cannot possibly recommend it more highly. It is, in my eyes, the series’ best installment to date. Oddball Verdict: Raid Your Wallet; This One’s Worth It.